As specified by the USCIS, we have requested that you act as an authorized representative of VentureLoop in completing Section 2 of the I-9 Form for our worker. This page includes instructions to assist you in this task. Complete Section 1 of the I-9 Form and bring the form with them to meet with you. Review the acceptable documents that will serve as (1) Identification and (2) Proof of Work Authorization and bring those ORIGINAL documents that will meet the requirements to the meeting. Completing Section 2 of the I-9 Form must be done no later than 3 days after the employee’s first day of work. If this is not complete, they will need to cease all work until they are able to complete Section 2 of the Form I-9. If you are not familiar with the I-9 Form or need a refresher, a link to a video as well as a USCIS page explaining Section 2 and the acceptable documents are included at the bottom of this page. When completing the documents section of the Form I-9, be sure you know which documents are acceptable and in which combinations. Common combinations include a 1) a US Passport in List A, 2) a foreign Passport in List A along with an appropriate visa or 3) a state drivers’ license along with a social security card in List B. 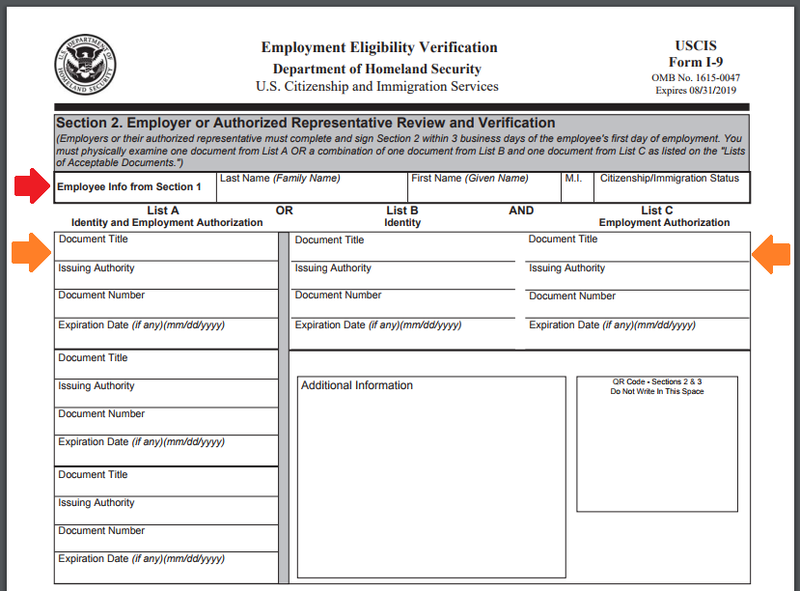 Be sure to fill in the employee’s name from Section 1 of the Form I-9. YOU MUST VIEW ORIGINAL DOCUMENTS FROM THE EMPLOYEE. You cannot accept photocopies or pictures of the documents in place of originals. If the employee does not give you photocopies of the original documents for our records, please use your phone to take a photo image of each original document that you used to verify the Form I-9. Finally, in the Certification section, you MUST enter VentureLoop as the employer and use our address of 700 Larkspur Landing Circle, Suite 199, Larkspur, CA 94939. The remaining information will be the appropriate dates, your name and the title “Authorized Representative“. Do not use any other title like “Notary” or “Agent”. Only use “Authorized Representative”. If you have any questions, you can always contact us at hr@ventureloop.com as well as (866) 424-1894 x2. You may find this video provided by the USCIS helpful (especially the parts included below). Finally, the USCIS also provides an explanation of Section 2 on their site as well as a list of documents that meet the requirements. Or, if you prefer this format, you can also find a list of documents that are provided within the I-9 documentation.